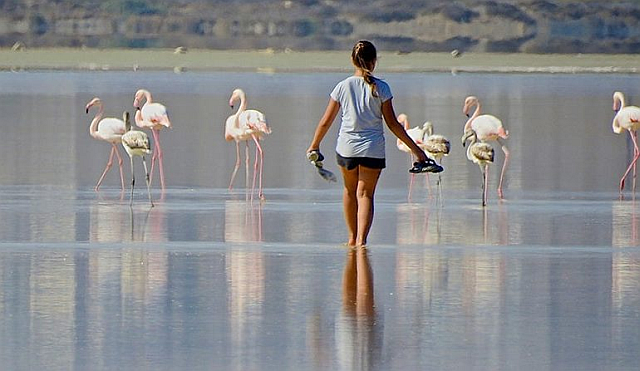 Huge numbers of greater flamingos can be seen on Larnaca and Akrotiri salt lakes over the winter. As part of their conservation remit, BirdLife Cyprus observers contribute to the International Waterbird Census by undertaking a count every January. The encouraging news is that the population is on the increase. 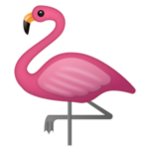 1 Where does the name ‘flamingo’ originate, and what is the connection with their colour? 2 Can you name any species of flamingo? 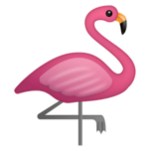 3 What gives flamingos their distinctive pink colouring? 4 Why would it be dangerous for the newly-hatched babies to be pink? 5 How does the whole colony come to breed at the same time? 6 Why are some birds brighter pink than others? 7 Usually mating for life, how do they attract the attention of a potential partner? 8 What is the life-span of the flamingo? You won’t believe the answer to this one! You can find the mind-boggling answers to these questions in 8 Amazing Flamingo Facts by Sarah McPherson on Discover Wildlife. The constellations, the moon, meteor showers and the International Space Station can all be seen easily with the naked eye, although you may find the villa binoculars enhance the experience. 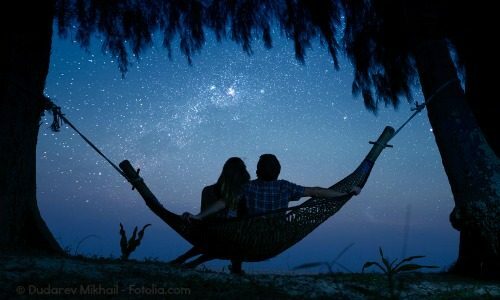 If you’re new to star-gazing, there is a variety of apps which use your smart phone or tablet camera to assist you in identifying the constellations, for example Google Sky Map. 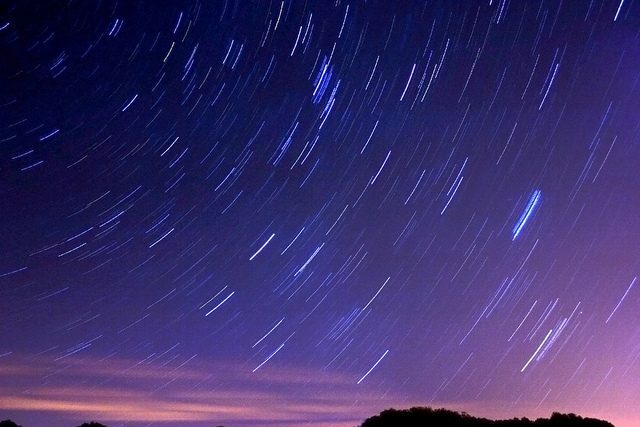 The Perseids are one of the brighter meteor showers of the year. Coming from the direction of Perseus, these tiny fragments from the Swift-Tuttle comet provide more than one meteor every minute. The peak dates for spotting these shooting stars is around August 9 to 13, although they can be seen on any dates between July 17 and August 24. 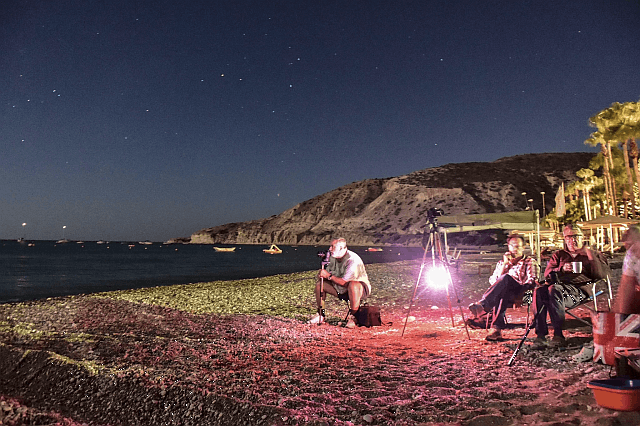 Our tip: Concentrate on one small part of the sky, rather than scanning too wide an area. Spot one and a multitude usually follow! 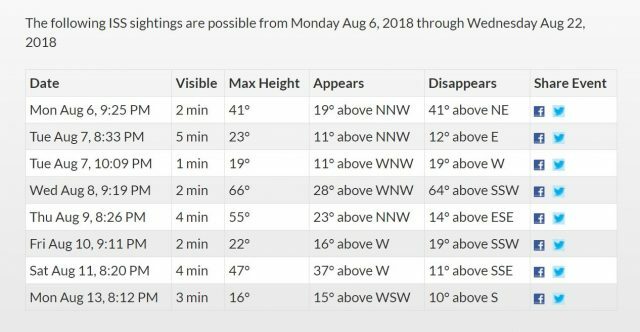 The International Space Station is most easily seen within a few hours of sunrise or sunset because the sun reflects off the space station providing a good contrast with the darker sky. 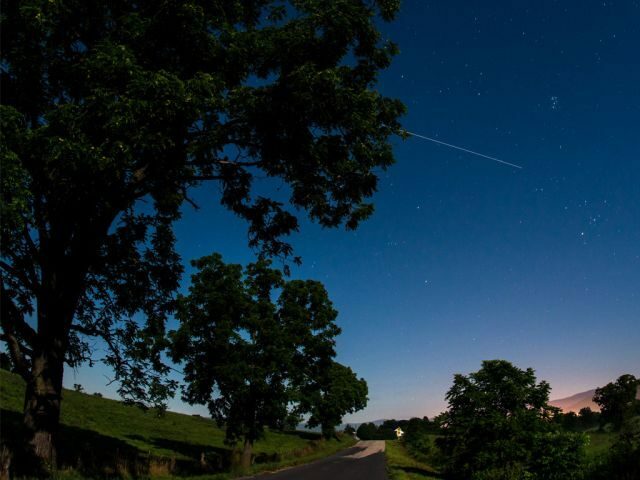 The space station looks like an aircraft or a very bright star moving across the sky, although moving in a straight line and 30 times faster. Alternatively, if you have an Android phone or tablet, download ISS Detector Satellite Tracker free app which can sound an alarm 5 minutes before the Space Station is due over your location. 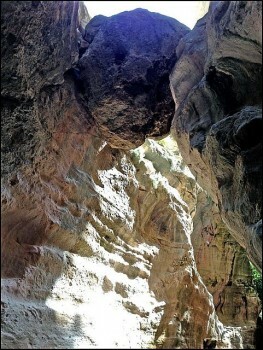 Thought you knew the Cyprus coastline? Surely no-one knows it like Andreas Papadopoulos. The detail in this meticulously researched app is fantastic – search for disabled access, public transport, picnic sites, watersports, sunbeds, WiFi. Plus maps, route planner, photographs, tips and a whole lot more. Once again these fine creatures have arrived in Cyprus for their winter migration. Making themselves at home in Cyprus’ wetlands, they arrive at Larnaca, Oroklini and Akrotiri salt lakes within days of the water level rising. When you see them in their characteristic heads-down pose they are filter-feeding on brine shrimps and blue-green algae using their rough tongues in their upside-down beaks. And it’s their shrimp-heavy diet that gives adult flamingos their distinctive pink plumage. To keep the flamingos returning year after year, it’s vital that nothing scares these vulnerable birds away by getting too close. Lessons have been learned, and a recent photography competition will not be repeated. Now the advice to photographers is to stay back and use long lenses. 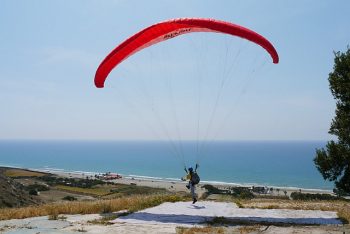 While the birds have over a period of years adapted to the hustle and bustle of Larnaca airport, the temptation to get better shots is encouraging ever-closer drone flying. And visitors are asked not to enter the water near the birds. 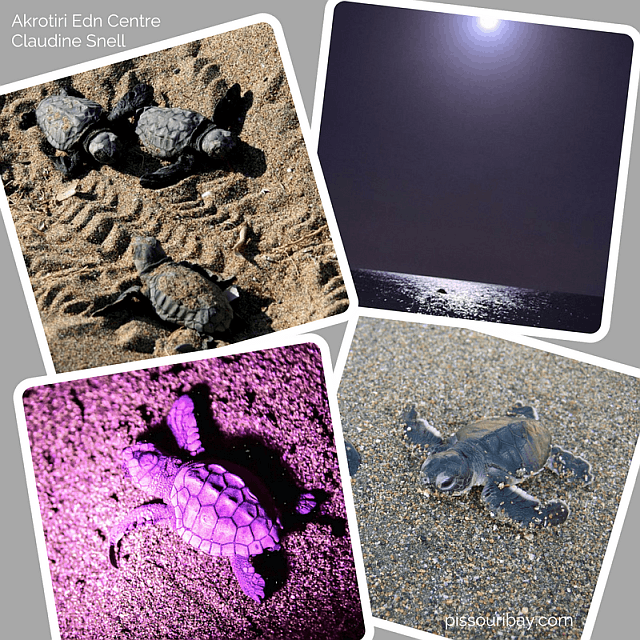 The safe way to see these marvellous creatures is to visit the viewing galleries at Oroklini Lake or Akrotiri Environmental Education Centre. 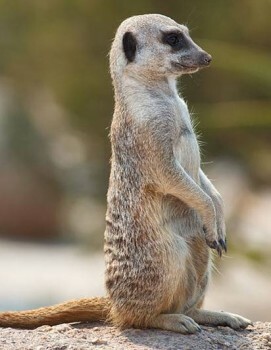 Both are equipped with binoculars and telescopes to allow you to get a close-up view from a comfortable distance. 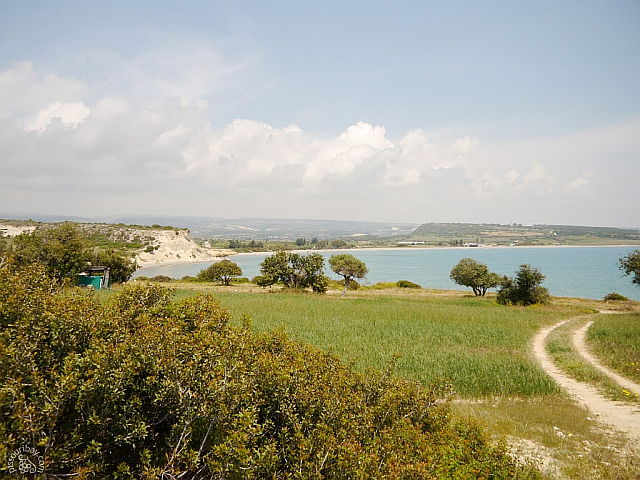 A 38 hectare wetland nature reserve ideal for bird-watching between Ayia Napa and Larnaca. Open year-round (although the lake dries up in summer), with free entry. 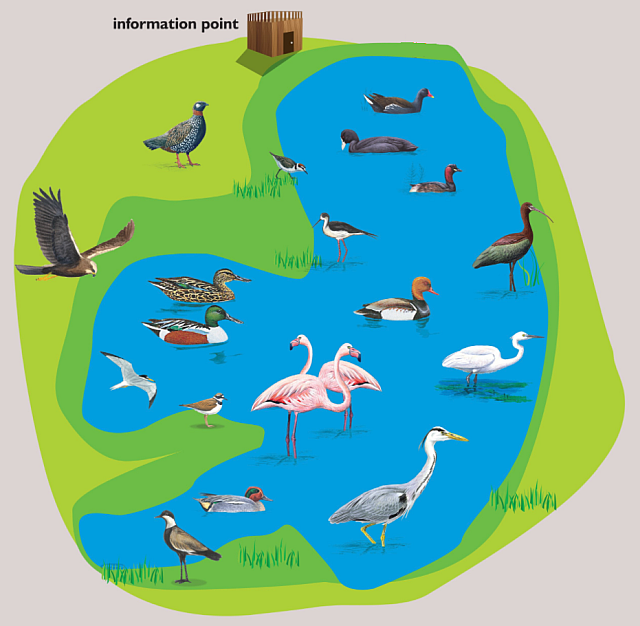 Facilities include visitor parking, observation platforms, information kiosk, identification boards, bird hide. 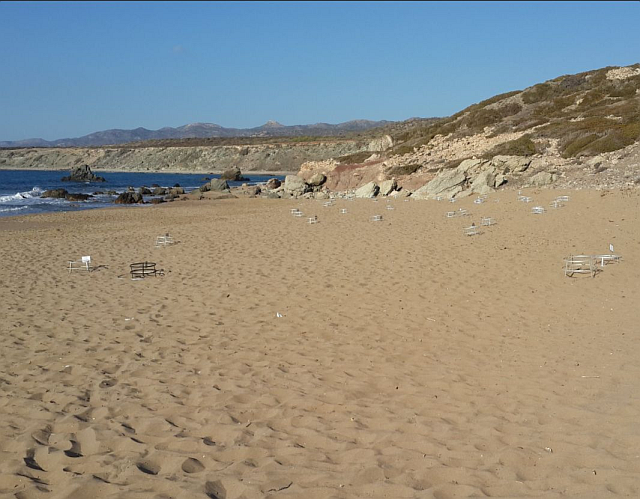 260 bird species have been recorded on the Akrotiri peninsula, of which 200 are migratory – using the area as a staging post. The area’s beaches are one of the few nesting sites on island for endangered Green and Loggerhead turtles. Dozens of nests are identified every year and are protected until hatching. Mammals recorded in the area include seals, dolphins and bats. If you are feeling energetic, this is a beautiful local walk to Melanda beach at Avdimou – the next bay to the east of Pissouri. Or drive as far as the road takes you, then choose a cross-country walking route from there. 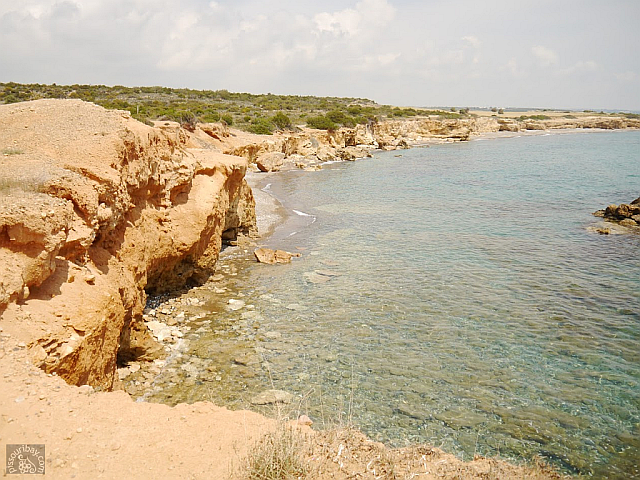 Our development – ‘Vineland Pissouri Bay’ is nestled at the base of a rocky cliff. If you head inland a little, then turn right at Ampelohori, you’ll find a road snaking up the hill to the top of the plateau (see map). On foot the climb is quite strenuous, as the ridge elevation tops 100 metres, so this is not something to be tackled in summer’s midday heat. No problem in a car, of course! The pay off is some lovely views looking down into Pissouri Bay, and across to Cape Aspro on the opposite headland. Once the tarmac road runs out, a variety of clearly defined vehicle tracks lead you eastwards cross-country. This is where you can leave your car and continue on foot. There are plenty of more direct routes, but we suggest following the cliff edge coastal path as shown on the satellite map, to take advantage of the fabulous seascape views. Hugging the coastline rewards you with a choice of deserted coves where you could enjoy the seclusion of your own tiny beach. 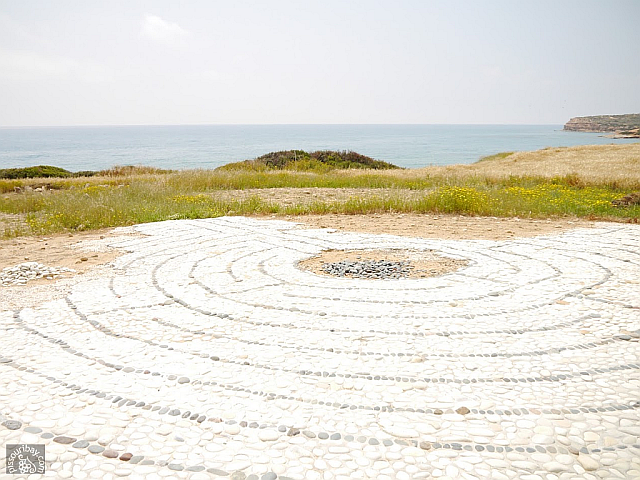 A fascinating surprise was some circular artwork lovingly created on the cliff top. We saw this pebble design and some traditional-looking crop circles in the tall spring grass. If you keep going, (for an hour or so beyond the end of the paved road), eventually you’ll arrive at Melanda beach. Using a smart phone with Google maps set on satellite view can help you to navigate. Near Melanda you cross into the British ‘Sovereign Base’ area – officially UK territory. Although development on this land is restricted, there are two permitted beach restaurants – Melanda Beach Restaurant specialising in fresh local fish dishes, and further along another favourite for traditional Cypriot fare – Kyrenia Beach Taverna. Indulge in a leisurely lunch and a few drinks – you’ll thoroughly deserve it! 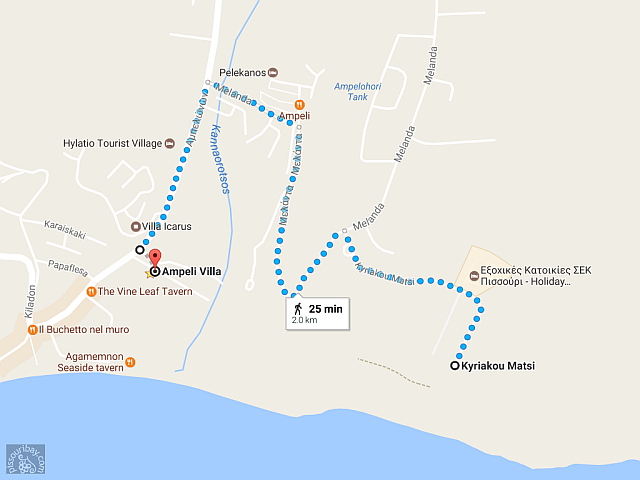 And if the prospect of walking back is too daunting, other options include a taxi or boat pickup… just remember to copy the numbers from the villa handbook into your phone before you set off. Choosing Restaurants: Old Favs vs New? 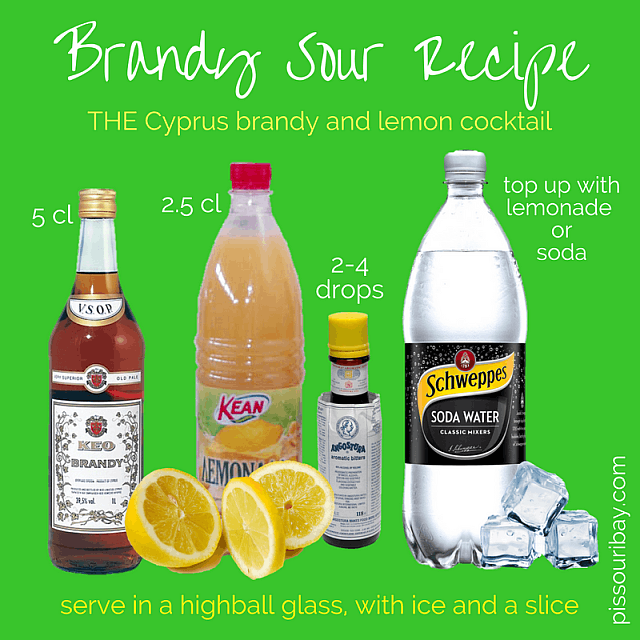 Maybe it’s because we’ll be travelling to Cyprus soon, but thoughts have turned to some of our favourite Cypriot dishes and tipples. Mouth-watering prospect! This led to thinking about the restaurants and tavernas we prefer, and why. It’s always a dilemma when you’re only on a short visit about whether to go for tried and trusted, or to brave somewhere new. Guest recommendations are not only useful for fellow guests, but they keep us up-to-speed too. Summaries of this feedback appear in the website guestbook, with printed versions in the villa. It’s no secret that we are big fans of Muse in Paphos. So many things combine to make a good (or bad) experience, including expectation, that it’s tricky to recommend places. Having said that we’ve thoroughly enjoyed every meal we’ve had at Muse (and there have been quite a few!) 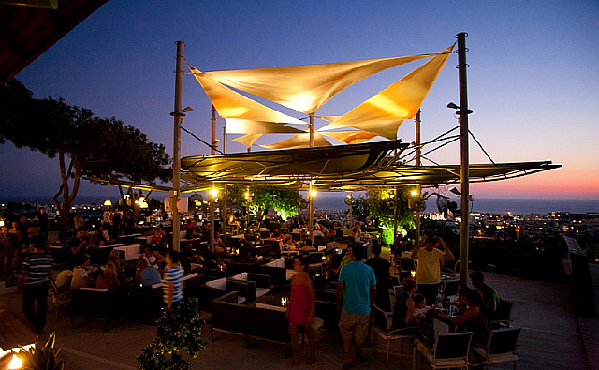 But our enthusiasm for Muse is not just about the food… we love the decor, the terrace, the lighting, the amazing views, the prices, and the service – phew! As it is a little tricky to find, we supply a map route and directions for our guests. 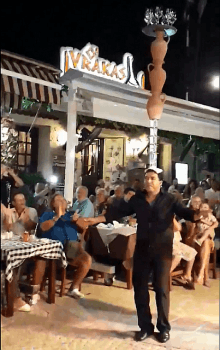 Not that you need to venture to Paphos for a great dining experience. In Pissouri Bay we are incredibly lucky to have so much choice close by… something regularly mentioned by new visitors. 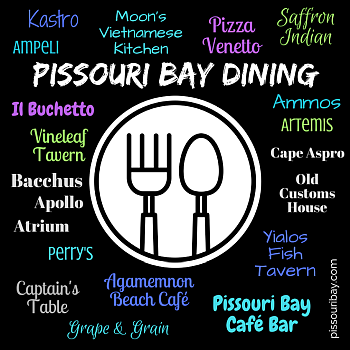 At the last count there were 15 places to dine in the bay itself, not including the hotel’s restaurants. You can see a complete list of the resort amenities on our maps page. Plus there are more restaurants up the hill in Pissouri village too. How many other places this size have so many dining options? There’s plenty of interest in Cypriot cuisine. 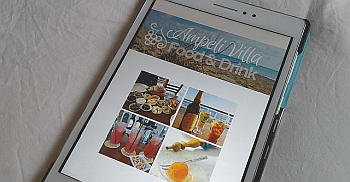 Our Cyprus Food and Drink G+ board is by far our most popular, having amassed a staggering 41,000 followers. And learning the stories behind Cypriot favourites such as Kleftiko and the Brandy Sour cocktail is fascinating. With 51 wineries, if you’re interested in doing a behind-the-scenes tour, along with a tasting, there are lots of options. This newly launched winery website has lots of useful information about what each winery offers. The CTO has also published a series of seven wine-routes taking you on scenic country drives around Cyprus’ wine-producing regions. For our free insider tips of Cypriot food and drinks, along with our fav places to try them, please sign up for our newsletter. For anyone visiting our local beach at Pissouri Bay, we thoroughly recommend you pay a visit to our friends Jeff and Mo at Chris Watersports. You’re sure of a warm welcome and professional service. There’s sunbed and parasol hire. And now you can have free WiFi – if you can tear yourself away from watching the world go by. With showers and changing rooms immediately behind their ‘hut’, you’re in the perfect beach location. Plus Philippos’ ice cream van is handily right next door! 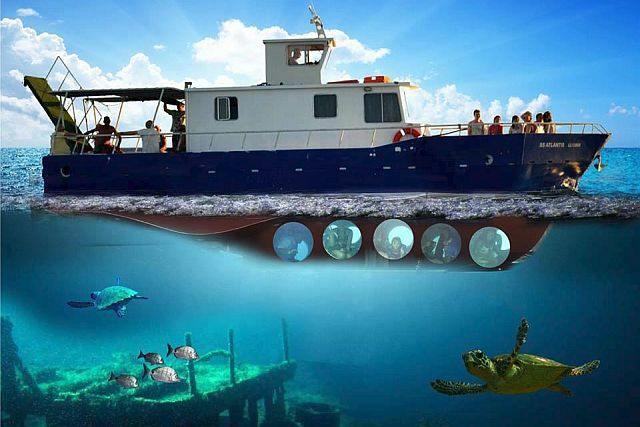 Rent a kayak and check out the crystal clear waters for sightings of turtles. This video showcases Chris Watersports brilliantly. You can hire unrestricted 250 and 155 bhp jet skis, or should I say jet bikes – as they have seats? If you’d like to try a new skill or practise an old one, you can book waterskiing, kneeboard or wakeboard lessons. But our fav is a ride on one of their towed inflatables which range from sofas to bananas – brilliant fun! And now they have another new one – Airhead – can’t wait to try it. If you’re feeling particularly adventurous, and confident that you have a good sense of balance, you can even book a flyboard lesson. This is an amazing piece of kit rather like a water-based hover board. 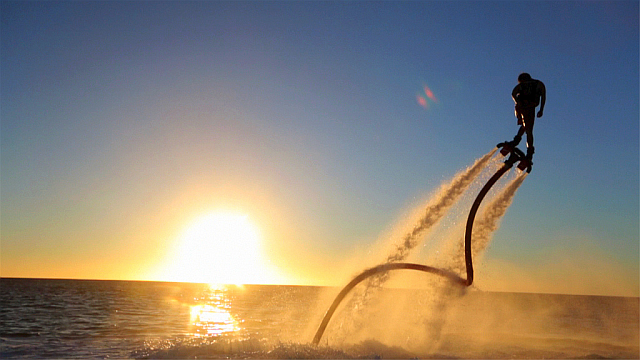 It works by sending a powerful water jet through a large hose – sending you soaring 30 feet above the azure waters. How Adventurous Is Your Family? 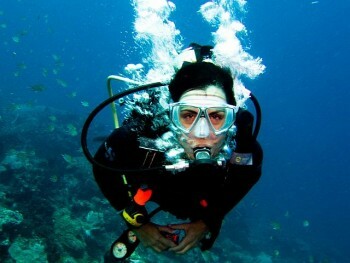 Do you like to try something new on holiday? 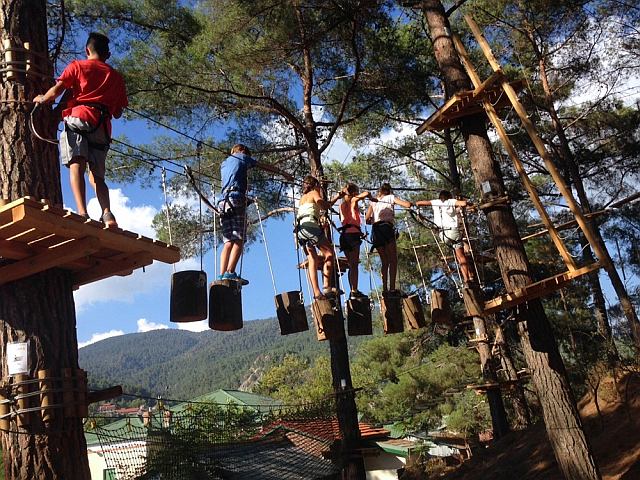 If so a visit to Sparti Park in the pine-clad Troodos Mountains could be for you. 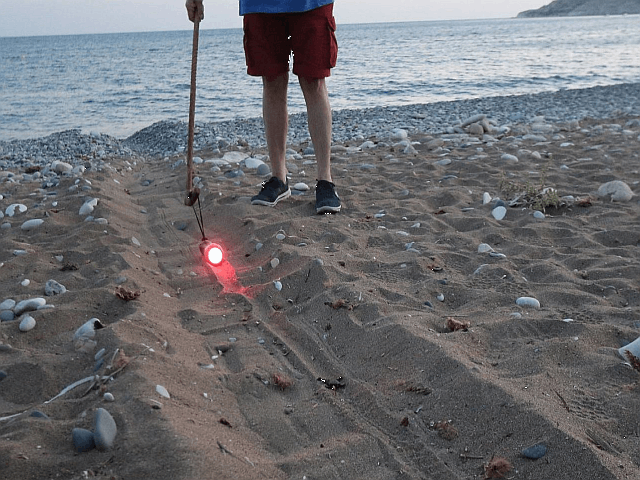 With activities suitable for ages from 3 to adult, this is something the whole family can enjoy together. Since opening in 2015, this zip-wire experience has been continually enhanced and developed. Adding to the original four lines offering different levels of difficulty appropriate for different ages, two zip-wires have been introduced for the youngest visitors (3-5 years), together with archery, crossbow and a free-fall jump platform. Altogether a great way to enjoy an adrenaline-rush escape in the cool mountain forests, creating a holiday memories to treasure. 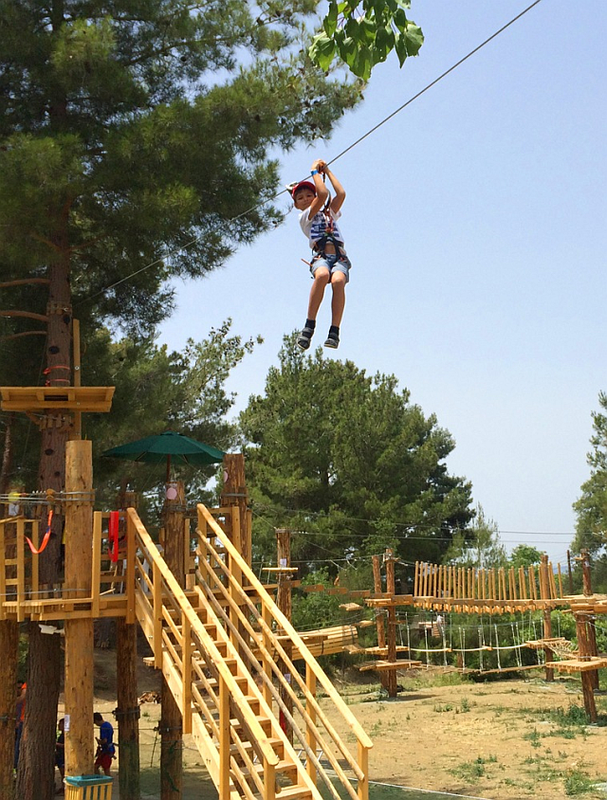 The first rope adventure forest park in Cyprus, named Sparti after the Spartans from Greece who specialised in physical training and fitness through obstacle courses and military training.